David W. Dodick reports the following conflicts from within the past 48 months. Personal fees: Amgen, Autonomic technologies, Axsome, Allergan, Alder, Biohaven, Charleston Laboratories, Dr. Reddy’s Laboratories/Promius, Electrocore LLC, Eli Lilly, eNeura, Neurolief, Novartis, Ipsen, Impel, Satsuma, Supernus, Sun Pharma (India), Theranica, Teva, Vedanta, WL Gore, Zosano, ZP Opco, Foresite Capital, Oppenheimer, Arteaus, Pfizer, Colucid, Merck, NuPathe, Ethicon J&J, Zogenix, Labrys, Boston Scientific, Medtronic, St. Jude, Bristol-Myers Squibb, Lundbeck, Impax, MAP, Tonix, Alcobra, Insys, Acorda, Biocentric, Magellan, Xenon, CC Ford West Group, IntraMed, SAGE Publishing, Sun Pharma, American Academy of Neurology, Decision Resources, Synergy, Peer View Institute for Medical Education, MeetingLogiX, Wiley Blackwell. CME fees or Royalty payments: Healthlogix, Medicom, Medlogix, Mednet, Miller Medical, PeerView, WebMD/Medscape, Chameleon, Academy for Continued Healthcare Learning, Universal meeting management, Haymarket, Global Scientific Communications, UpToDate, Oxford University Press, Cambridge University Press, Wolters Kluwer Equity (stock options): Aural analytics, Healint, Theranica, Second Opinon/Mobile Health, Epien, GBS/Nocira, Matterhorn/Ontologics, King-Devick Technologies. Board of Directors: Aural analytics, Epien, Matterhorn/Ontologics, King-Devick Technologies. Patent: 17189376.1-1466:v Title: Botulinum Toxin Dosage Regimen for Chronic Migraine Prophylaxis. 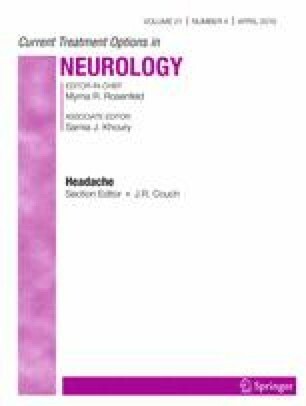 Professional society fees or reimbursement for travel: American Academy of Neurology, American Brain Foundation, American Headache Society, American Migraine Foundation, International Headache Society, Canadian Headache Society. Other: use agreement through employer Myndshft. Expense reimbursement from West Virginia University Foundation, Oregon Health Science Center, Albert Einstein University, University of Toronto, Starr Clinical, University of British Columbia, University of Southern California, and University of California, Los Angeles. Consulting use agreement through employer: Neuro-Assessment Systems. Jill C. Rau reports personal fees from speaking at an Amgen sponsored educational event on a general topic outside the submitted work.